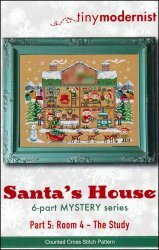 Santa's House Part 5: Room 4 - The Study [E6437] - $2.00 : Yarn Tree, Your wholesale source for cross stitch supplies. Cross stitch pattern from Tiny Modernist. Look at all of the hustle & bustle inside "Santa's House!" A elf is hanging the mistletoe above the big red chair, where kitty is taking a nap. I think the elves have worn the kitty out! Stockings hang above the warm fireplace, with candles & garland decorating the mantel. The warm cookies have been pulled out of the oven. The dining room table is set for dinner. Outside the snow is falling & Santa's reindeer are eating their dinner. "Santa's House," is just about complete. Who do you think will arrive, in room number 5? Stitch count is 140h x 179w.